As a tribute to the most important civil engineering works of the 20th century, the American Society of Civil Engineers (ASCE) has prepared a ranking with the seven wonders of the modern world. Among them is the Panama Canal, the oldest construction on a list in which it competes with the Empire State Building in New York, the Golden Gate Bridge in San Francisco and the Eurotunnel linking France and the United Kingdom. Opened on 15 August 1914, the construction of the canal became a titanic struggle against the elements: malaria, yellow fever, landslides, floods and a humid climate. More than a century later, the great transoceanic bridge that joins the Pacific and the Atlantic through the Isthmus of Panama is still operational and now accommodates larger vessels, thanks to its subsequent expansion. 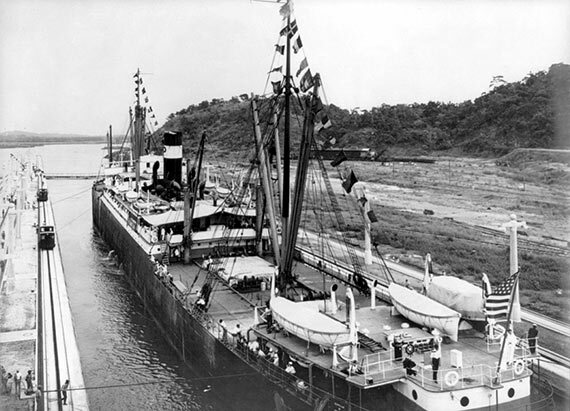 The SS Ancon was the first ship that crossed the Panama Canal on August 15, 1914. Credit: Library of Congress. “The Panama Canal was indeed one of the greatest engineering projects of all time,” Henry Petroski, professor of Civil Engineering at Duke University (USA), tells OpenMind. 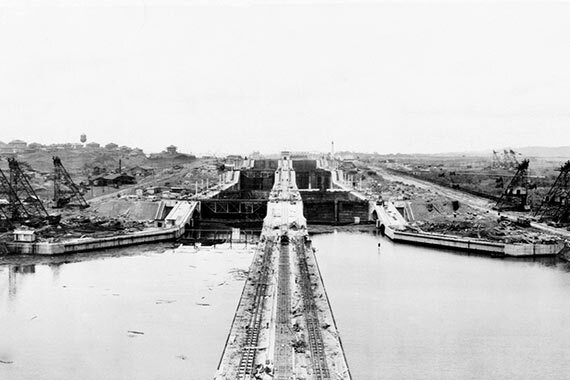 Unlike the Suez Canal, which links the Mediterranean with the Red Sea, the Panama Canal required not only the opening of a huge breach in the terrain, but also the development of a sort of water bridge that, through a system of locks, raises the ships by hydraulic propulsion to an artificial lake, from which they leave following the same mechanism. Thus the designers managed to overcome the unevenness of the terrain. In the review of the book The Path between the Seas: The creation of the Panama Canal, 1870-1914 (1977), the historian Antonio Santamaría recalls that even in the times of Christopher Columbus, the Spanish sailors worked hard to find a natural passage that would allow them to reach Asia from the newly discovered lands. The Canal joins the Pacific and the Atlantic through the Isthmus of Panama. Credit: Library of Congress. Four centuries later, the French diplomat and businessman Ferdinand de Lesseps, encouraged by the success he had achieved with the construction of the Suez Canal in 1869, decided to imitate the process in Panama. However, it was a total failure as he designed the project as a sea-​​level canal, without locks to deal with the unevenness of the landscape. The humid climate, very different from the dry Suez, tropical diseases and a rocky and mountainous terrain, with a maximum height of 95 metres—very different from the flat and sandy ground of the other canal—turned the project into a national embarrassment. The cost overruns and some corruption scandals led to legal actions and a subsequent conviction against the builder. After the failure of the French initiative, the American colonel George Washington Goethals picked up the baton. “The French, at that time the world’s best engineers, had failed and the United States managed to conquer diseases, landslides, earthen dam construction and concrete mixtures for the locks,” summarizes Frank Townsend, professor emeritus of Civil Engineering of the University of Florida (USA) for OpenMind. In total, some 42,000 workers dredged, dynamited and excavated huge amounts of land from the Caribbean city of Colón all the way to Balboa, the gateway to the Pacific Ocean. They moved enough earth and debris to bury the island of Manhattan to a depth of more than three and a half metres. Including the French attempt, it is estimated that some 25,000 people died, mostly as a result of malaria and yellow fever. “One of the main challenges faced was the terrain of the isthmus. The design called for digging 50 miles (80 kilometres) in length and 30 feet (9 metres) below sea level,” highlights Tom Smith, executive director of ASCE, for OpenMind. The advantage of the system of locks and the central Gatun Lake contained by a dam was that the Americans didn’t have to excavate nearly as much as the French planned to do with their sea-level canal, which saved time and economic costs. With the locks, ships comfortably deal with a difference in elevation of 26 metres between sea level and the lake. After ten years of construction, on August 15, 1914, the SS Ancon was the first ship to cross the canal, but its inauguration was never celebrated because only a few weeks earlier the First World War had broken out. Although the maritime traffic of the initial years was less than expected due to the conflict, on average 15,000 ships crossed per year. 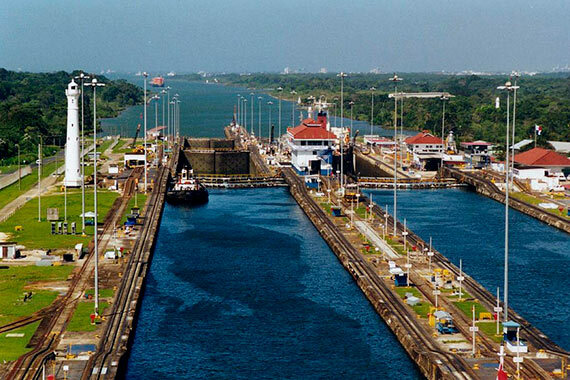 The administration of the canal now having been transferred from the United States to Panama, expansion works began in 2007, which continued until June 26, 2016. Their main novelty was a new system of locks that permitted the access of larger vessels and that reused 60% of the water employed in each operation. In total, 192,000 tons of steel were used, the equivalent of building 19 Eiffel Towers. In addition, the extension added a third lane for the transit of larger ships. Another novelty was to increase the water level of Gatun Lake by 45 centimetres to improve the water supply. In the opinion of the experts consulted, with this refurbishment the canal will be able to remain fully operational for at least another century.